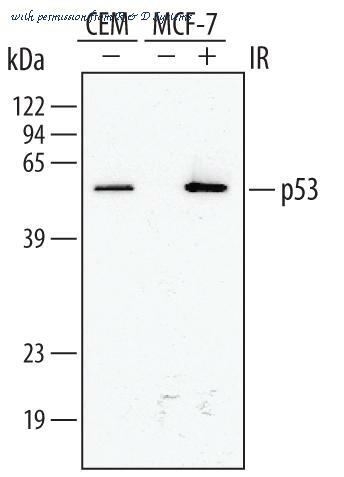 The P53 antibody from Proteintech is a rabbit polyclonal antibody to a recombinant protein of human P53. This antibody recognizes human, rat, mouse antigen. 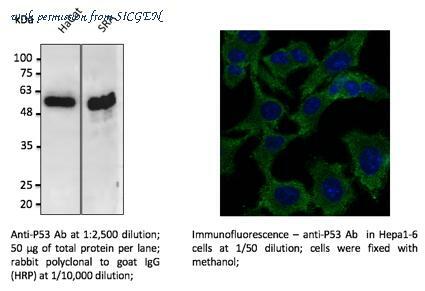 The P53 antibody has been validated for the following applications: ELISA, IP, WB, IF, IHC analysis. 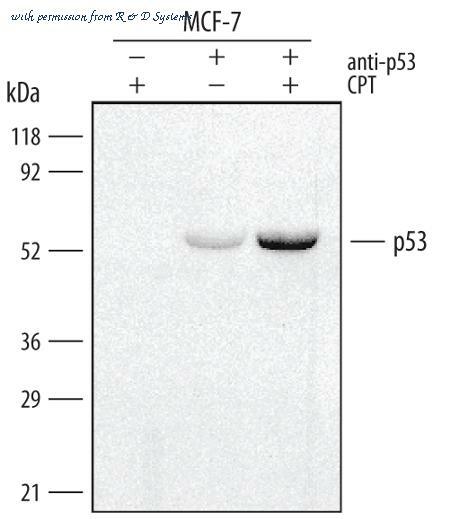 The P53 antibody from Proteintech is a mouse monoclonal antibody to a recombinant protein of human P53. This antibody recognizes human, mouse,rat antigen. 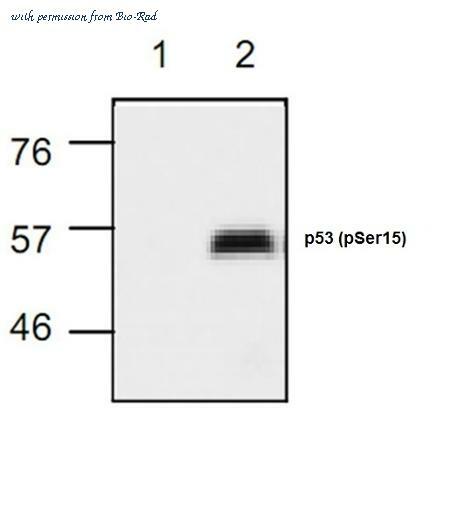 The P53 antibody has been validated for the following applications: ELISA, IHC, IP, WB analysis. 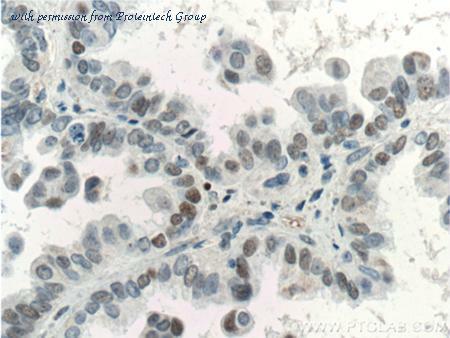 The TP53 antibody from Proteintech is a rabbit polyclonal antibody to a fusion protein of human TP53. This antibody recognizes human,mouse,rat antigen. 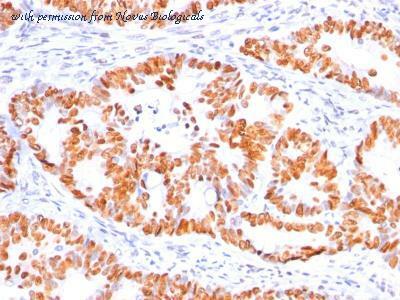 The TP53 antibody has been validated for the following applications: ELISA, IP, WB, IF, IHC analysis. 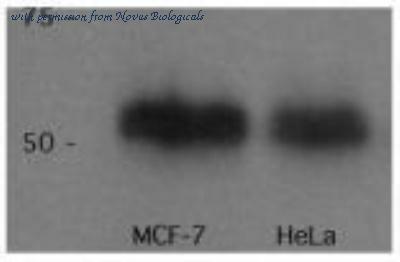 Western Blot: p53 Antibody (PAb 240) [NB200-103] - WB analysis of p53 in MCF7 and HeLa lystates. Image courtesy of anonymous customer product review. 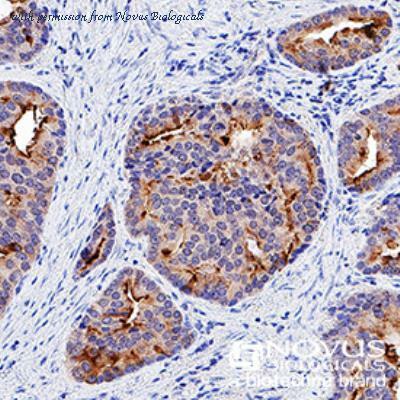 Immunohistochemistry-Paraffin: p53 Antibody (PAb 240) [NB200-103] - p53 was detected in immersion fixed paraffin-embedded sections of human prostate cancer using anti-human mouse monoclonal antibody (Catalog # NB200-103) at 1:200 dilution overnight at 4C. Tissue was stained using the VisuCyte anti-mouse HRP polymer detection reagent (Catalog # VC001) with DAB chromogen (brown) and counterstained with hematoxylin (blue). Images may not be copied, printed or otherwise disseminated without express written permission of Novus Biologicals a bio-techne brand. Flow (Intracellular): p53 Antibody (PAb 240) [NB200-103] - An intracellular stain was performed on HeLa cells with p53 (PAb240) NB200-103 (blue) and a matched isotype control NBP2-27287 (orange). Cells were fixed with 4% PFA and then permeablized with 0.1% saponin. Cells were incubated in an antibody dilution of 2.5 ug/mL for 30 minutes at room temperature, followed by APC-conjugated anti-mouse IgG secondary antibody F0101B. Simple Western: p53 Antibody (BP53-12) [NBP2-29453] - Simple Western lane view shows a specific band for p53 in 0.2 mg/ml of MDA-MB-231 lysate. This experiment was performed under reducing conditions using the 12-230 kDa separation system. Immunohistochemistry-Paraffin: p53 Antibody (BP53-12) [NBP2-29453] - Formalin-paraffin human colon carcinoma stained with p53 Ab (BP53-12). Simple Western: p53 Antibody (BP53-12) [NBP2-29453] - Electropherogram image of the corresponding Simple western lane view. 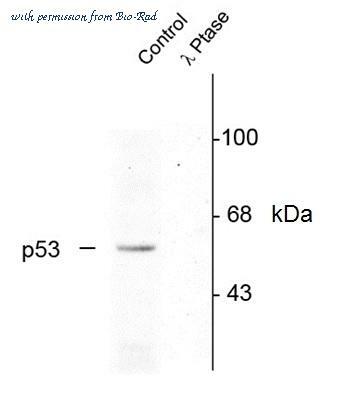 p53 antibody was used at 10 ug/ml dilution on MDA-MB-231 lysate(s) respectively. 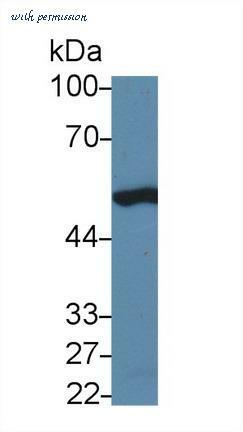 Western Blot: p53 Antibody (PAb421) [NBP2-62555] - Western Blot using anti-p53 antibody PAb421 A431 cell nuclear (A) and cytoplasmic (B) extract (35ug protein in RIPA buffer) was resolved on a 10% SDS PAGE gel and blots probed with the chimeric rabbit version of PAb421 (NBP2-62555) at 0.1 ug/ml before detection by an anti-rabbit secondary antibody. 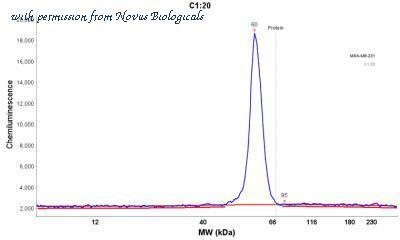 A primary incubation of 1h was used and protein was detected by chemiluminescence. The expected band size for p53 is 43.7 kDa, though due to the high number of proline residues in this protein runs at a size of ~53kDa (c.f. Ziemer et al., PMID: 7107651). NBP2-62555 successfully detected both human nuclear and cytoplasmic p53. Detection of Human p53 by Western Blot. Western blot shows lysates of CEM human T-lymphoblastoid cell line and MCF-7 human breast cancer cell line were mock-treated (-) or exposed (+) to 10 Gy ionizing radiation (IR) and harvested after 1 hour. 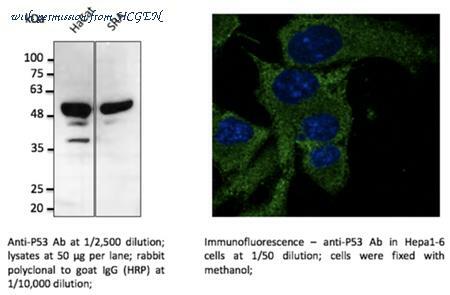 PVDF membrane was probed with 0.5 ╡g/mL of Goat Anti-Human/Mouse/Rat p53 Antigen Affinity-purified Polyclonal Antibody (Catalog # AF1355), followed by HRP-conjugated Anti-Goat IgG Secondary Antibody (Catalog # HAF109 ). A specific band was detected for p53 at approximately 53 kDa (as indicated). This experiment was conducted under reducing conditions and using Immunoblot Buffer Group 1 . Detection of Human p53 by Western Blot. Western blot shows lysates of MCF-7 human breast cancer cell line mock-treated (-) or treated (+) with 1 ╡M camptothecin (CPT) for 1 hour. 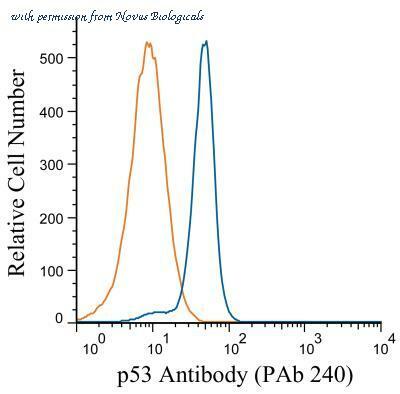 Human p53 was immunoprecipitated using Mouse Anti-Human/Mouse/Rat p53 Monoclonal Antibody (Catalog # MAB1355). PVDF membrane was probed with HRP-conjugated Anti-Human/Mouse/Rat Polyclonal Antibody (Catalog # HAF1355 ). A specific band for p53 was detected at approximately 53 kDa (as indicated). This experiment was conducted under reducing conditions and using Immunoblot Buffer Group 1 . Detection of Human p53 by Western Blot. Western blot shows lysates of CEM human T-lymphoblastoid cell line and MCF-7 human breast cancer cell line untreated (-) or treated (+) with 10 Gy ionizing radiation (IR) for 1 hour. PVDF membrane was probed with 1:5000 dilution of Human/Mouse/Rat p53 HRP-conjugated Antigen Affinity-purified Polyclonal Antibody (Catalog # HAF1355). A specific band was detected for p53 at approximately 53 kDa (as indicated). This experiment was conducted under reducing conditions and using Immunoblot Buffer Group 1 . Western blot analysis of p53: Lane 1: MW marker, Lane 2: A431, Lane 3: rat brain, Lane 4: mouse brain. Western Blot of Rabbit anti-p53 pS392 antibody. 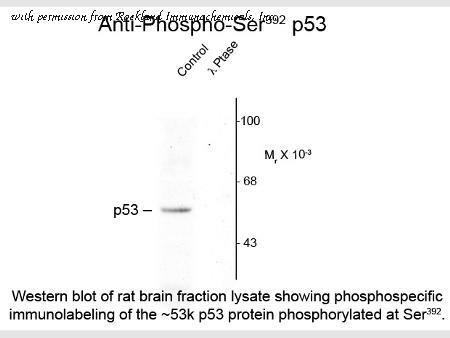 Lane 1: rat brain nuclear fraction lysate (control). Lane 2: ?-Ptase. Load: 10 µg per lane. 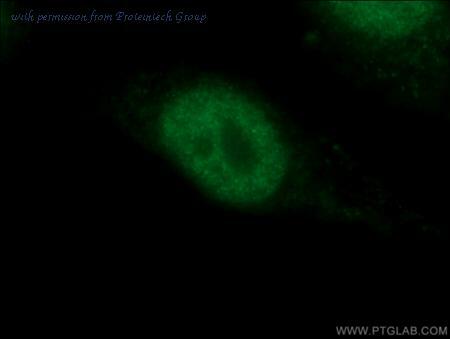 Primary antibody: p53 pS392 antibody at 1:1,000 for overnight at 4°C. Secondary antibody: IRDye800™ rabbit secondary antibody at 1:10,000 for 45 min at RT. Block: 5% BLOTTO overnight at 4°C. Predicted/Observed size: 53 kDa for p53 pS392. Other band(s): none. 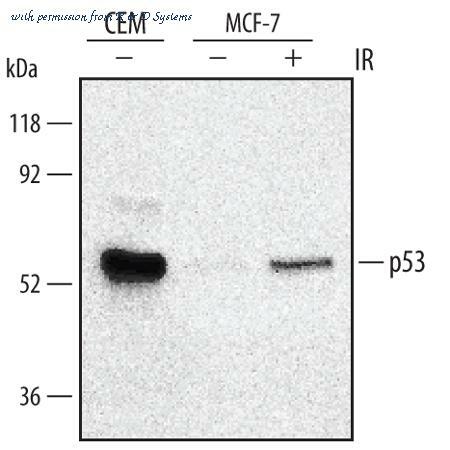 Western blot analysis of MCF-7 lysates using FL 393 antibody. 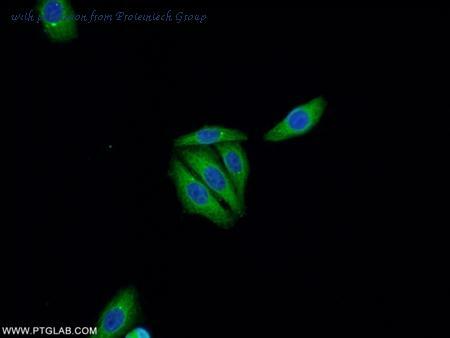 Immunohistochemical staining of Rat bladder tissue using FL 393 antibody. 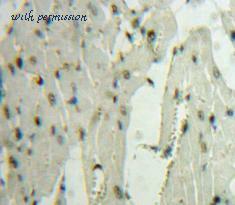 Immunohistochemical staining of Rat stomach tissue using FL 393 antibody.